Never did old Bob coin a more universal phrase and he’s not even a fisherman. Yet if you think about it, it ought be adopted as the still water fisherman’s anthem. We’d touched down in Edinburgh airport around 8.15 am. The journey’s former pristine skies now stained ominously by inky lowering clouds. Muggy the atmosphere, wind pregnant with moisture and close to birthing. Typical, isn’t it. We’d been praying for rain all the previous week. Dry Salmon rivers are no fun and it hadn’t rained seriously in the Borders for nearly two months. And now we’d arrived to what looked like the onset of Noah’s flood! How the fishing gods tease. Rain? We’ll give em rain! Buckets and bath loads of it, turning skeletal rivers into coffee coloured torrents over the next twenty four hours. But at least they’d graced us on our first day, planned for a flying visit to a private brown trout Loch. 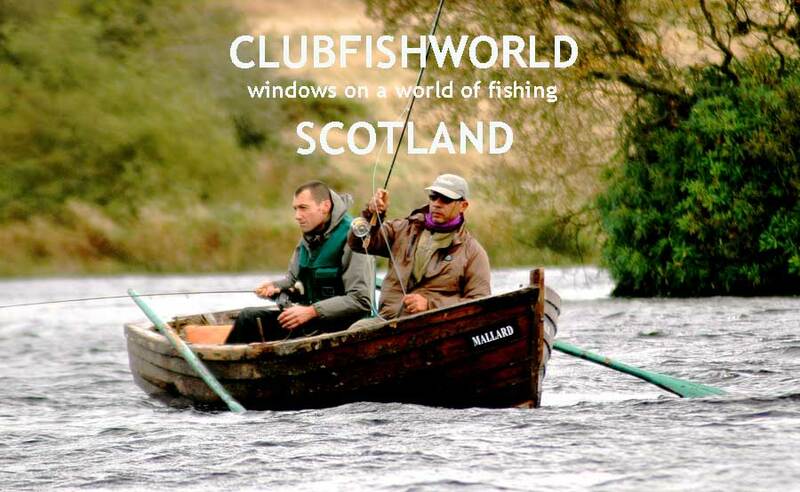 Fin Wilson, angling correspondent for ‘Scotland on Sunday” had arranged the Salmon trip for myself and traveling companion, Fabrice Monell, editor of Peche Mouche, France’s leading fly fishing magazine. Needless to say the conversation on our ninety minute journey to the loch was filled with impossibly complicated permutations on what the weather held in store for our fishing. And in spite of the doom laded sky, Fin still wasn’t convinced it was going to rain just yet but the wind was certainly on the blow. I’d never fished a loch before (or even a large reservoir) but I’d read the articles, seen the photos and was excited at the prospect. I’d imagined bushy flies and droppers, made the casts, teased the fish to take and scooped them from peaty waters to admire them in the net. But I wasn’t prepared for the beauty of this little 4 acre jewel about to unfold before my eyes. The loch owner ushered us through immaculate green gates to a parking area bordered by massive clumps of Rhododendrons. Following him down the Rhody pathway we arrived at a traditional boathouse on the shores of the loch. Weatherworn but still visible, ‘1880’ chiseled in relief on the granite lintel above the door. Beyond the boathouse, the relative calm of a densely wooded bay offering tunnel vision to impressive hills overlooking the far side of the loch. And in between, an increasingly hostile expanse of open water fleckjing in the strengthening winds: limestone base beneath peaty waters, rich in food and handsome wild fish. Except for a more clement day, what more could a guy ask for. Fin and Fabrice headed for open water whilst Euan had a hankering for prospecting the lily pads on the edge of the bay. By now the waters were really kicking up and Euan suggested the bushiest palmered flies in the box as top droppers (Bibios, Zulus, Kate McLarens, Soldier Palmers) with weighted wets or nymphs on the point (hares ear and black pennels his flies of choice) Normally he’d use both (he likes his droppers long to allow a more natural presentation) but the strength of the wind was too great to handle all 3 flies comfortably. At the end of the second drift, Euan was into a fine fish close to the bank off a small feeder burn, but it shook off again before it was under control. Funny thing , though. Euan boated the same fish on the same Kate MacLaren dropper a couple of drifts later. It was a cracking two pounder – but canny wild fish? Originally, I’d been first to hook into a fish (and naturally the first to lose one) but a couple of drifts later I managed to keep hold of a nice one pounder on a weighted hares ear. I was pulling off to recast after a last bit of jinking when he must grabbed it in panic before it disappeared from view. And let me tell you, little or no, these wild brownies put up a mighty struggle for their weight; jetting under and around the boat, then a bit of aerial acrobatics for good measure before coming to the net. Now it was really blowing and even with a drogue it was difficult not to be stripping hard the whole of the drift, and the bushy wake fly was barely visible in the heavy chop. So it seemed like an opportune time for soup and sandwiches back in the boathouse – the other boat following close behind.Fin and Fabrice had taken 4 fish between them. Two on the Kate MacClaren but tied as a weighted nymph (versatile wee lassie) And a cracking 2.1/4 lbs beautifully marked hen fish on an orange Soldier Palmer. Weighted hares ear accounting for the fourth. The morning’s session just about evens between dropper and wake fly. We swapped round for the afternoon session and I joined Fin in the manly boat: bigger, heavier, displacing more water which helps slow down the drift (my smaller morning boat would have skated the surface like a jet ski but for the drogue)So maybe there was little between them when it came to the drift - just a lot more effort to move it back to square one. By now the rain had kicked in heavily and I wasn’t wearing waterproof trousers (another lesson taken on board) But in spite of conditions it wasn’t cold, so Fin and I set off in anticipation of more fish to be had. But the real afternoon action took place in the other boat. Euan’s experiences at the back end of the season have led him in the direction of a less classic approach. Normally his first choice of a pulling fly would be a black pennel. But in these more extreme condition he swears by a (lure-like) orange marabou with a fritz on the point. Sacrilege for a traditional trout loch some might say but devil’s need when you’ve only a couple of hours spare for the last session. I also had a heart-stopper when a large one cleared the water attempting to grab the bob fly at the start of a back cast. God knows what would have happening if it connected in mid air. Text books tell you drop the rod but I’m pretty sure I would gone the other way in panic! But the light was going fast, the rain getting heavier and the wind beyond control. So back to the boat house for a last drop of warming soup before hitting the road for our hotel. It was a great pity we hadn’t more time to investigate the water but it had certainly been a short sharp learning curve for me. Techniques I’m sure that can be carried back to our more southerly reservoirs, which after this experience I’m even more keen to try out. I’d originally learned to fish on small still waters and leap frogged to rivers, leaving a large (reservoir) hole in my fishing education. So, orange is very good colour for peaty waters in a blow - especially for larger browns. First, they’re more confident in coming from the depths in the choppy water: less line shy, less aware of the boat, and most important, they’re on the hunt to stock up on large tasty morsels for the coming lean months. All the day’s biggest fish were caught with orange variations on both point and dropper. But my overriding impression (we’re back to dear old Bob) was that the answer my friend, does lie in the wind – the most extreme prevailing condition on the day. It governed the speed of retrieve against the drift, dictated the mood of the water, the behaviour of the fish, and the subsequent choice of flies. And conversely on a blazing hot dog day in August, It can cool high air temperatures, ruffle a flat calm, oxygenate the water and enervate the fish to feed - and it’s direction concentrates food sources aiding the location of fish. I’m sure its page one to everyone else (or maybe its just I’m completely wrong) but if you’re fishing still waters, big or small, isn’t wind (or even lack of it) the most important factor that determines your day? Now if you ever fancy some time on a Scottish Loch yourself, contact Fin Wilson. In addition to being an angling journalist and successful indie rocker, he now runs a guiding service and knows the waters like the back of his hand.